In our modern times the text is available to the general public just like a lot of other books. It is not just another book though. Its level is extremely high, at professional standard really. All Igo Hatsuyo-ron Problems are available in Sensei's Library. For official solutions and scholarly comments you should consult one of the printed editions (or the online versions based on them). Yutopian have published volume 1, containing the first 63 problems and solutions. In Japan, four versions of this life and death classic have been published. 1914 version with commentary by Honinbo Shusai and Inoue Inseki XV. 1980 version with commentary by Hashimoto Utaro 橋本宇太郎. 1982 version with commentary by Fujisawa Hideyuki 藤沢秀行, published by Heibonsha. The first three versions contain 202 problems divided to six categories. The 1982 version, the most recent one, has only 183 problems. Suspect copy cat problems from Xuanxuan Qijing 玄玄棋经 have been removed after comparing the text with a considerably older private-edition woodcut-print book (荒木氏版本). In addition, the 1982 version contains 2 problems missing from the first 3 versions. As stated by the original author in the book's preface: "this book contains 180+ problems carefully selected from a set of 1,500 problems.". The 1982 version is believed to be a more reliable version of the book. All four versions of the book share a common structure: the answer to the problem is brief, coupled with detailed explanation and in-depth commentary. As is well known, this book is a professional level text to be used by professional players. It is not appropriate for amateur players. It is compulsory for professional players to master this book. December 2003, the China Pro commentary version《发阳论新解》（修订本）revision is published, as belief the most up-to-date version for the classic so far. 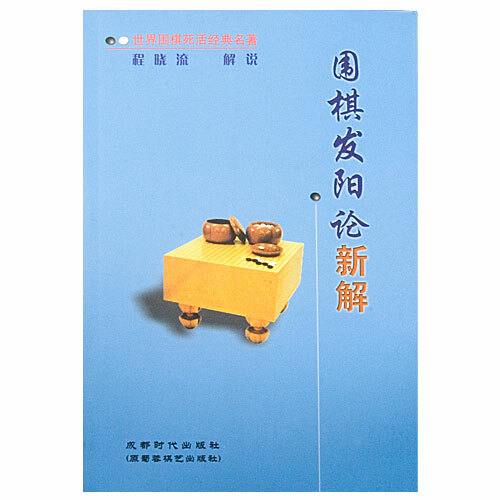 August 2010, 围棋发阳论研究 (= Research on Weiqi Fayanglun) is published by People’s Sports Publishing House, ISBN 9787500936985. Author Cheng Xiaoliu gives new and updated sequences for many of the problems. Cheng Xiaoliu's 2010 "Research on Weiqi Fayanglun" can be found at http://www.amazon.cn/%E5%9B%B4%E6%A3%8B%E5%8F%91%E9%98%B3%E8%AE%BA%E7%A0%94%E7%A9%B6-%E7%A8%8B%E6%99%93%E6%B5%81/dp/B003ZC4B1E, for example. John Fairbairn Hatsuyou (not hatsuyo) means "generating yang" which is here a way of saying tactics. Igo = go, ron = discussion. There is no reference to world. See my introduction in the Yutopian book if you need more detail. kklim: Hatsuyou 《发阳论》， is also known as 《不断樱》（do not know how to translate into english meaning here, from word should mean "non-stop sakura"） indicating that the book contains a number of colorful and clever moves, and that the tesujis follow one another rapidly without respite. John F. The alternative name is Fudanzakura, which is the name of a kind of cherry tree (sakura) famous for its continuous (fudan) long blooms - this being, of course, the precise opposite of what cherry tree blooms are normally famous for in Japan (Iro wa nioedo, etc). From my understanding from various sources, and this should interpret in ancient meaning: Hatsuyou 《发阳论》- game piece and similar items call "yin 阴"， and skillful move hidden behind the shape is call "yang 阳". And 发阳 can be understand in plain english as discovery of those hidden, and yet effective skill moves. Bill: In the afterword Inoue says 見分る手段は陽なり, which I take to mean that discriminating means is yang (in the context of go).